Isn't that just lovely? The bottle description of "soft & delicate with a silver sparkle!" is spot on, but here's what they don't tell you: That not just silver sparkle, it's holographic silver sparkle! Of course the glitter is too sparse to be anything linear, but it reflects a rainbow of colors under all lighting. My camera couldn't really capture the super-fine microshimmer, but it does show the microflakies pretty well. The pink color itself is a perfect pale pink. It doesn't lean peach, it's not overly blue or purple, it's just pink like pink should be. I loved it on my pale skin but couldn't help thinking how awesome it would be on dark-skinned ladies! It's a very wearable color, appropriate for any age and pretty much any occasion. It's feminine and beautiful. I really can't believe this isn't a more popular color from piCture pOlish! Now here's the bad part: this was 4 coats - four! And it wasn't even completely opaque; you can see the visible nail line in my pictures. While it was wearable it didn't feel "finished" to me. Of course, this isn't a terrible problem. I'm planning to revisit this color layered over a similar pale pink. 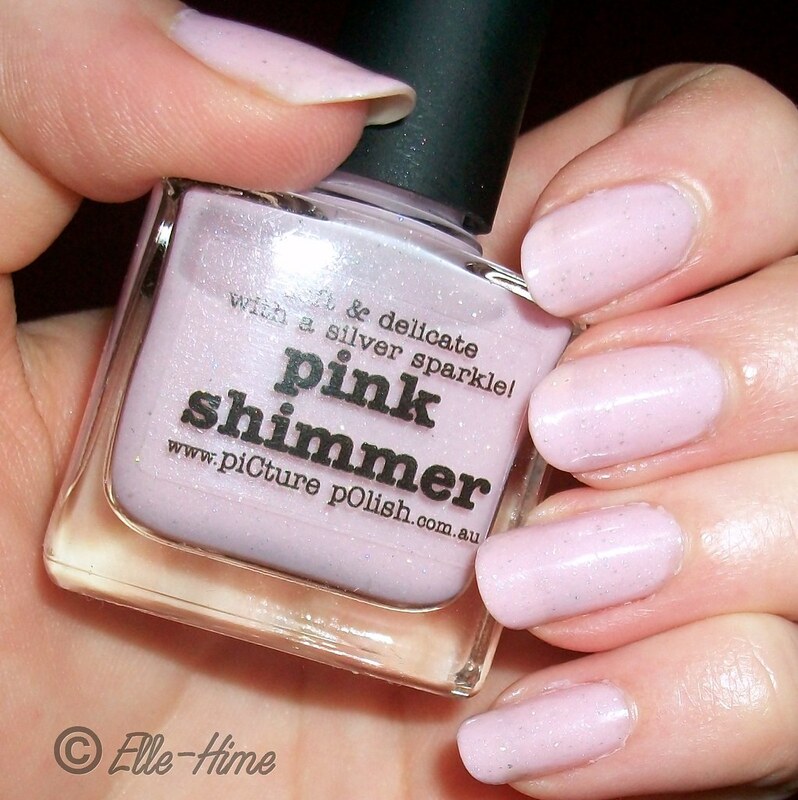 If I can get the look I want with only 1 or 2 coats of Pink Shimmer layered then I'm fine with that, as it will save my little bottle of piCture pOlish, which is precious to me and rather costly to replace. More good news: This was very easy to work with. The formula wasn't as thick as their color Twinkle, and dried shiny. Also, I wore this without top coat for a few days. It stayed shiny, only had one chip and very minor tip wear on the other nails. I can only imagine it would have been fabulous with a top coat. Also, clean-up was great. I'm a messy painter, always getting polish on my fingers alongside my nails. After this had dried for awhile it came right off my skin, no hassles. And my nails were perfect! I love pale pinks but it's hard for me to find ones that "look right" to me. This one is perfect! 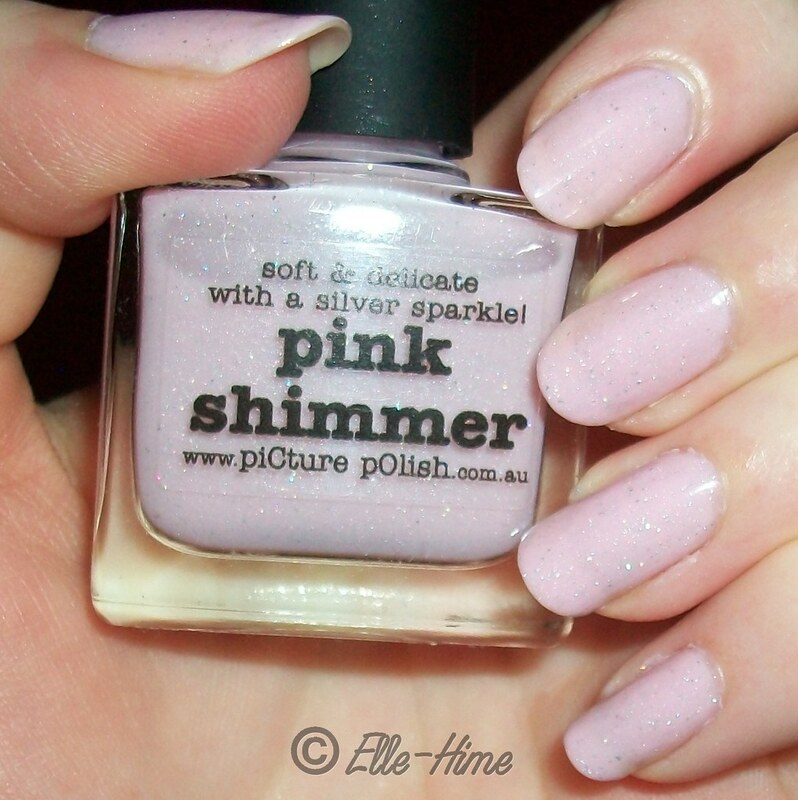 And I've never seen a polish with this type of glitter dispersed through it. Definitely something special! Oh how cute! I need to pick this one up! It's kind of funny, no matter how many polishes I get I still adore these delicate pinks!